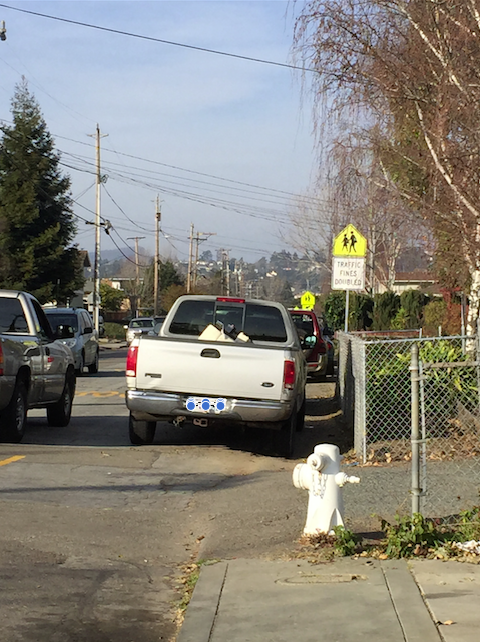 An example of the unimproved sidewalk on Anita Ave in Castro Valley. Anita Avenue Sidewalks: PWA plans to reapply for funding for a design grant in order to address sidewalks, which will require purchasing property from the property owners to widen the street. In the meantime, they will be repaving the road using federal funding. They cannot add paved sidewalks both because the federal grant does not include doing so and because there are considerations like drainage that would need to be taken into account before they could do anything like that. I asked him about our idea of “compact” parking along the narrow sections of Anita and he said he didn’t know how that could be enforced. He suggested we check with law enforcement on whether this idea is feasible. Heyer Avenue Sidewalks: PWA needs to seek design funding to begin this project. Art cited this as a high priority for PWA. Lake Chabot Road Sidewalks: Current funding is only for the roadway and not for sidewalks. Anytime they touch a roadway, they are required to add the ADA curb cuts regardless of any other work (or not) on sidewalks. The project on Chabot Rd. has been to narrow the travel lanes in order to add bike lanes. So far they have completed the narrowing from Castro Valley Blvd. to Quail Ave., and the temporary line along the edge is an edgeline for now. The next section is from Quail to the park. They will complete the resurfacing and then paint in the bike lanes for the entire stretch. Unfortunately, sidewalks are not part of this grant. Mabel Avenue Sidewalks: PWA already has design money for sidewalks on Mabel across from the high school. They are beginning the design phase. Somerset Avenue Sidewalks: PWA needs funding for the design phase, which will include plenty of public input. At present, they are focused on sidewalks as the top priority. Absent any changes through public input, Class III bike lanes would be included as stipulated in the Master Plan. Stanton Avenue Sidewalks: PWA needs design funding to begin this project. In a few days, I’ll provide the final recap which will include an update on the crosswalks we discussed.